Did you try connecting from another PC or network? It can get hard to find problems on a specific location. Reboot may help terminate any existing conflicting programs. Make sure you have the latest version 3574. If you are unable to download file or install due to an Anti Virus, please disable it for 15 minutes. Make sure your are the windows administrator where you are installing the service. 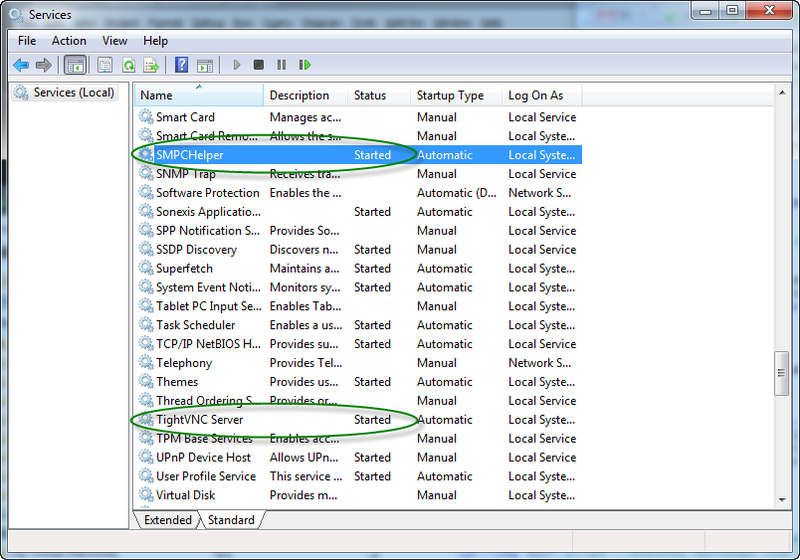 While installing Access Home or Office Service, UAC should be turned On. Make sure that the date and time on your PCs is correct (Required for in built security). To avoid conflicts, enter lower case hostname and email. Watch for any messages or pop up dialogs, your firewall or AntiVirus software might show. 1. Unable to Connect or do not see my Remote PC in the list? Make sure you have installed the service following the email that was sent to you. Please verify that your remote PC is still on network. It should not be on sleep or hibernate. Using the HTML Version can help, in cases the Viewer program is having any trouble connecting. Quick test. Get help from a co-worker to reboot the remote PC, PC should reappear back in the list. Make sure you are not on a wireless network, use regular Ethernet cable. If problem persists reinstall the service on remote PC. Any other use of VNC viewer can conflict with ShowMyPC. If the problem persists, please try Viewing from another PC, just to make sure problem is isolated to this one PC. In application send "Options > Debug Report" and Open a ticket if all the steps did not help. 2. Seeing Multiple Windows or Toolbar? If you are seeing multiple windows or toolbars, you could be connecting to yourself, See instructions here to Fix. 3. My Remote PC shows a red cross on it or is missing (Offline). It was working earlier. 4. Forgot remote access password? If you have forgotten login information of the remote PC. You will have to reinstall the service. ShowMyPC support cannot help you with resetting the password as no password as kept with us. This error can happen on some NON English Operating Systems. To resolve, please make sure you copy the program to your c:\yourShowMyPCApp.exe and run it from that location. If the problem persists open a ticket and ask for customized build for your non English system. If you get Authentication error, please make sure you are using the correct combination of Hostname, Email and password. (All Case Sensitive). Make sure Internet Explorer is working on both the Viewer and Remote PC. Test your network connection on both PCs. Check services by going to "Start > Control Panel > Administrative Tools > Services". Make sure both "SMPC Helper" and "tvnserver" are running. Contact Support for any additional help. What is your application version? Make sure you have the latest version 3572. I just purchased and not sure what to do. Make sure you got instructions in your email. If takes few minutes to get them. If not contact ShowMyPC Support. You will need 2 PCs to use this service. See how to use. For advanced configuration of the support application see details from your email. My paid version used to work but right now it is not working. Check for any outage notice on ShowMyPC Support page. Make sure you are not connected to any VPN. It is hard to debug on a specific PCs, you should try an other PC. Reboot may help in fixing the problem, by closing any conflicting programs. ShowMyPC does not work within RDP or Windows Remote Desktop session. Some few firewall or anti-Virus software may block ShowMyPC. Please update your Anti Virus software. My paid version is not working. Any new recent software might conflict with ShowMyPC. Getting error 'Your connection has been rejected'. If you are getting this error message, it is very likely that your remote user has some variation of VNC installed and is conflicting with ShowMyPC. Please try with another user remotely, to verify your local connections are fine. Ask your remote user to uninstall any VNC and try again. Getting error 'Primary server unavailable'. Generally "Primary server unavailable." means a drop in the network on the Viewer side. Most times as the network drop corrects, the error corrects itself. Close your Viewer program and re launch it and try again. If problem still persists, try rebooting your Viewer PC and make sure you have network connectivity. To verify and isolate the problem you may also try to View from a different PC. The latest ShowMyPC version may not work on Windows 2000, its due to dropped support by Microsoft and other partners. If you planning to use on Windows 2000, please ask support for older ShowMyPC version 3081 for your account. Free Version is not working. Some few firewall or anti-Virus software may block ShowMyPC. In fact any new auto updated to these software might start blocking.